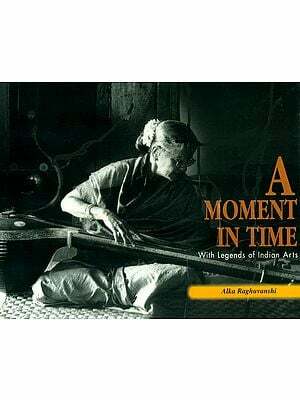 With Krishnamurti's death in 1986, aged 90, Mary Lutyens was able to complete her perceptive books on this extraordinary man. Only now has she been able, in this one volume biography, to bring his life into true perspective. 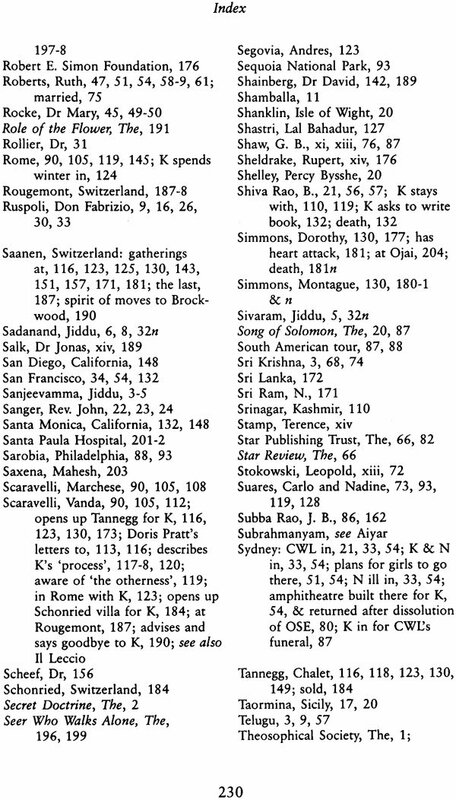 It is a brief but absorbing account of Krishnamurti's life, and in it she seeks to understand his death (and Death itself) in terms of his own words on the subject. 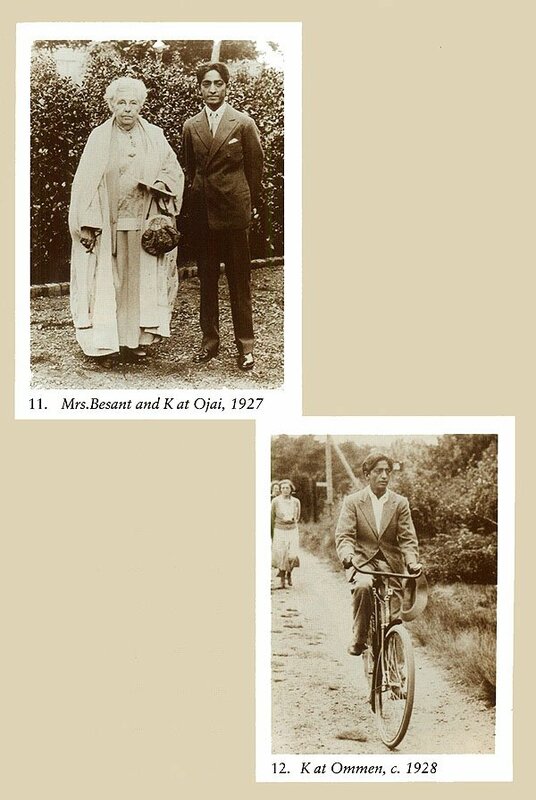 The author claims no more than to introduce Krishnamurti's teaching, but by studying his own exploration into its origin, she is able to give help to the reader who wishes to delve deeper, as many will. Having known him from the time he first came to England as a new Messiah under the aegis of the Theosophical Society. 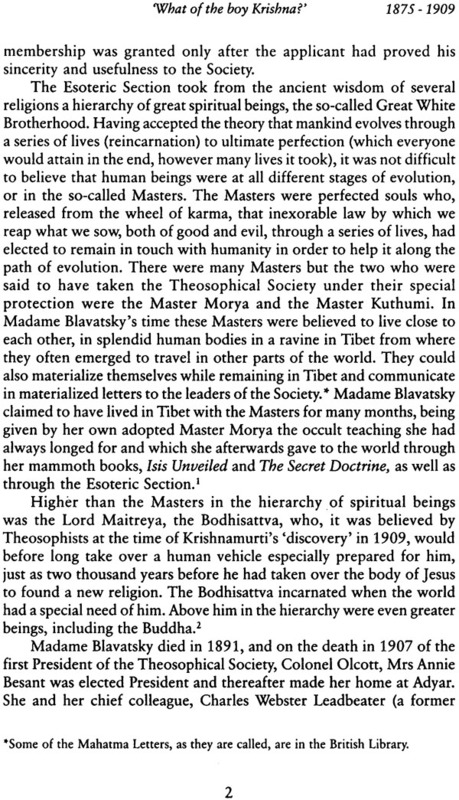 From which he dramatically broke away in 1929, no one is better qualified than Mary Lutyns to see Krishnamurti's life as a whole and to search for an answer to the question. 'Who or what was Krishnamurti?' He was himself specific as to what he was not: he was no guru and deplored the very existence of a guru-disciple relationship: he was the leader of no religious organization-he maintained that all such organizations were barriers to truth equally relevant to all. It was his objective to set us free from everything that prevents us from discovering truth for ourselves. 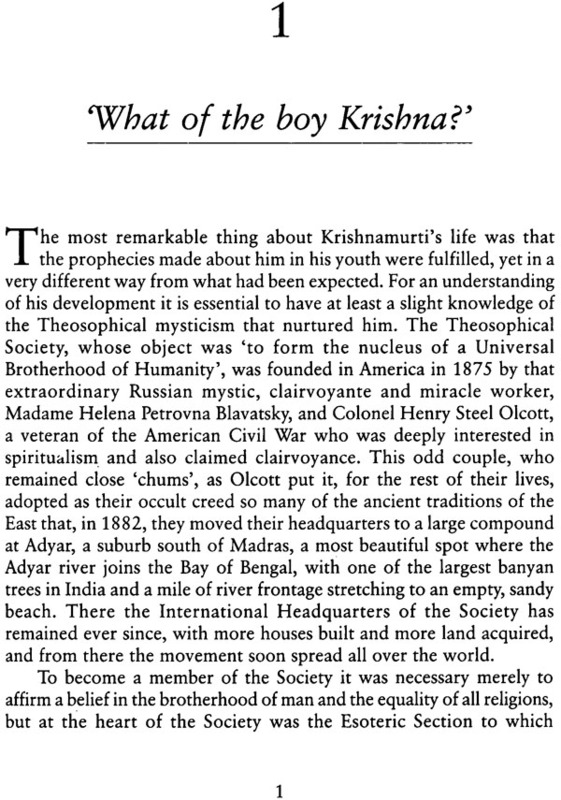 Krishnamurti sought to bring understanding, not comfort. An austere philosophy, but a subtle one, which stimulated hundreds of thousands of people in many parts of the world to seek to bring about a complete psychological change in themselves as the only means of ending violence and sorrow. Schools and centres were founded in his name in Europe . America and India, which spread this teaching throughout the world. Krishnamurti emerges from this book as not only a phenomenal teacher but as a man with deep affections and a love of laughter. 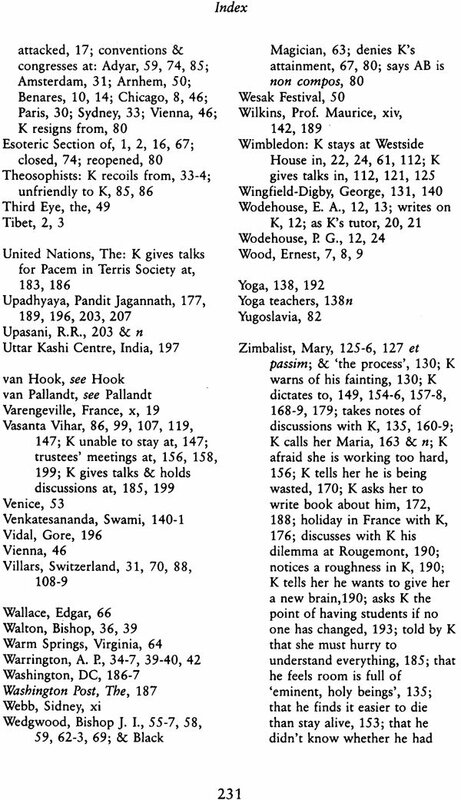 Krishnamurti requested several times that there should be no authoritative interpretation of his teaching, although he encouraged those interested in it to discuss it among themselves. This present book, therefore, makes no attempt to explain or evaluate the teaching which is available in dozens of books, cassettes, audio and video tapes. Its aim, rather, is to try to discover the source of the revelation on which the teaching is based, to illuminate the nature of a most remarkable human being, to trace the course of his development and see his long life in perspective. 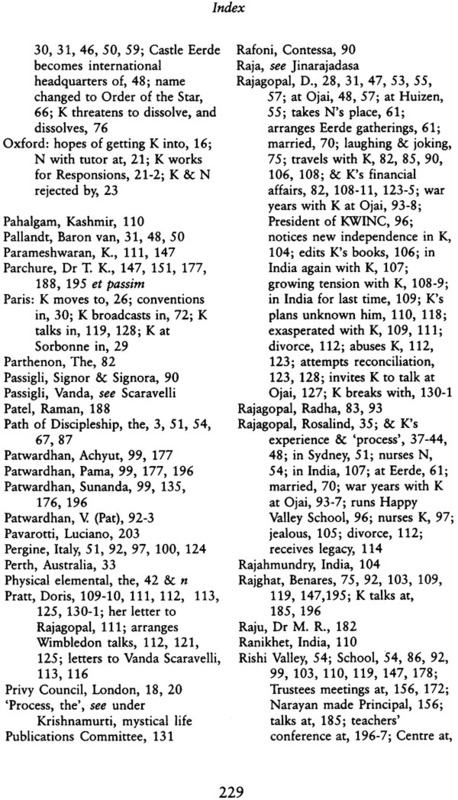 This it is difficult to do in three detailed volumes separated by a space of years. - eight years in the case of the first and second volumes. After the first volume, The Years of Awakening, was published I was asked whether I believed in the happenings I had recorded. My reply was that I certainly believed in them until 1928 - that is, until I was twenty - with the exception of the crazy events in Holland in 1925. Subsequently, my attitude to them changed in accordance with Krishnamurti's own. 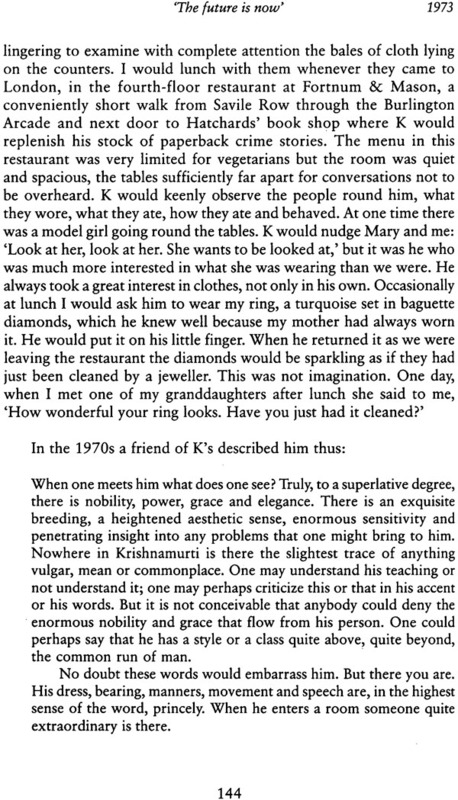 I cannot remember a time when I did not know Krishnamurti. This was because my mother had befriended him when he first came to England in 1911, a bewildered young man of seventeen, seeming much younger than his age, who, two years before, had been chosen by the leaders of the Theosophical Society in India as the vehicle for the coming messiah. 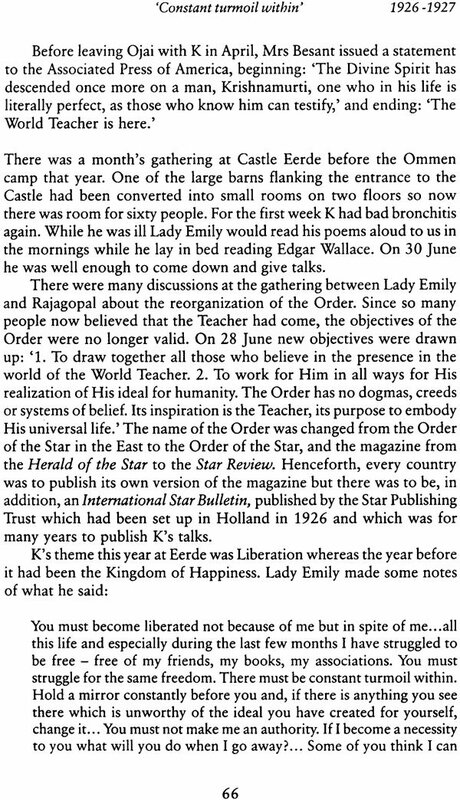 My mother had joined the Theosophical Society in 1910, before I was three years old, and I was brought up on its tenets which were outwardly very simple: a belief in the brotherhood of man and the equality of all religions. Instead of' Our Father which art in heaven ... ', I was taught to recite every morning: 'I am a link in the golden chain of love that stretches round the world and I promise to keep my link bright and strong.' There was, however, an esoteric heart to Theosophy of which I did not become fully aware until I was about thirteen. This esoteric core and the founding of the Society will be described in the first chapter of this book. Theosophy was to cause a breach between my parents which widened as the years went by, yet, ironically, it was through my father that my mother discovered Theosophy. In 1909 my father, Edwin Lutyens, had received a commission from a French banker, Guillaume Mallet, to build a house for him at Varengeville on the coast of Normandy, not far from Dieppe. On my father's return from his first visit to the site he told my mother that the Mallets were Theosophists. When she asked him what that meant he said he did not know but that they had a secret cupboard of books which they always kept locked. This intrigued my mother and when she accompanied my father on his next visit to Varengeville she persuaded Madame Mallet to give her a short outline of Theosophical beliefs. What struck her most was the normality of the Mallets, the lack of crankiness in them which she would have associated with a 'quack' religion. Their only eccentricity was that they were strict vegetarians. 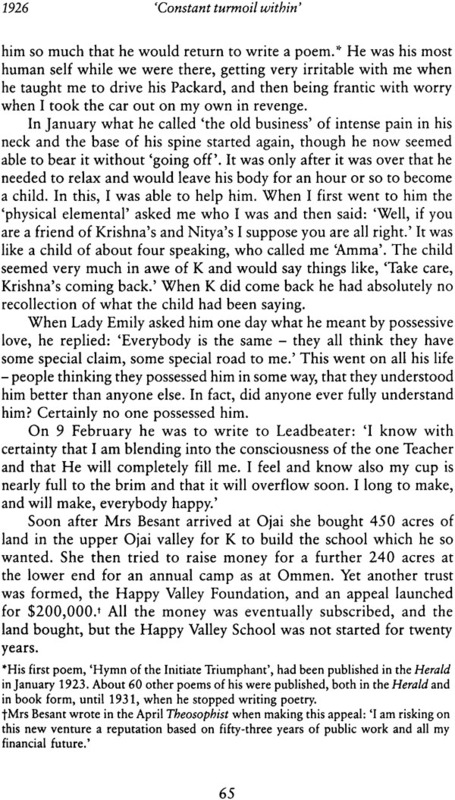 At Christmas, Madame Mallet sent my mother the London Lectures of 1907 by Mrs Annie Besant,* President of the Theosophical Society, which filled her with such 'absorbed interest and delight', according to her autobiography, t that at moments she became 'so excited' that she could hardly restrain herself' from shouting with joy'. It seemed to open up to her new vistas of spiritual understanding. MY mother was ripe for conversion. After thirteen years of marriage to an increasingly ambitious, successful architect, who, although loving her passionately, was so absorbed in his work that he had no time to give her or their five children any companionship, she was desperately searching for some satisfying occupation to stimulate her emotional and intellectual needs. Housewifery and ordinary social life bored her intensely and her children were cared for by a perfect nanny. She had become an ardent supporter of the Womens' Suffrage movement (but was never a militant for fear of going to prison and being forcibly fed); she had read a great deal of sociology and joined an or-ganization called the Moral Education League, concerned with the State-regulation of prostitution for which she wrote pamphlets and attended conferences in many parts of England. As part of this work she became a weekly visitor to the Lock Hospital for the treatment of venereal disease where she read Dickens to the patients. (She had a superb gift for reading aloud.) She also organized evening discussions at our house in Bloomsbury Square to consider such questions as heredity versus environment. 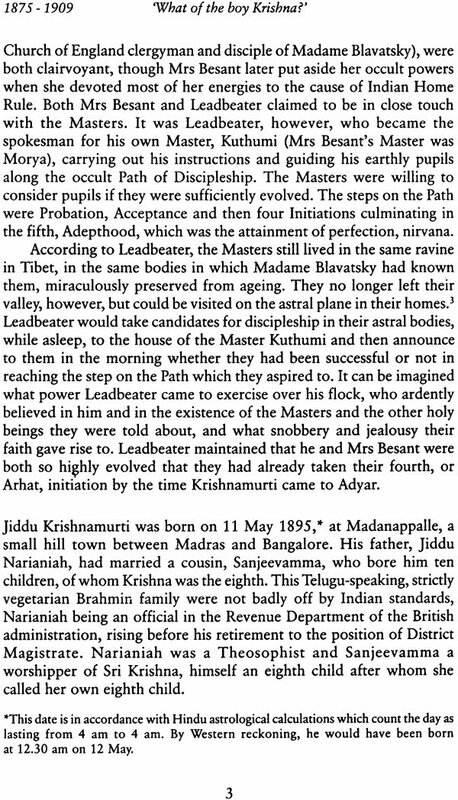 But, unlike so many of her contemporaries, she was not interested in spiritualism, * nor, at that stage of her life, in occultism or Indian mysticism which had drawn so many Westerners to the East since their Christian faith had been undermined by Darwin. A few weeks later my mother heard her speak again at a hall in Kingsway on 'The Coming Christ', and afterwards found the courage to approach her and ask her to lunch. She accepted. The only other person present at the lunch was my father. 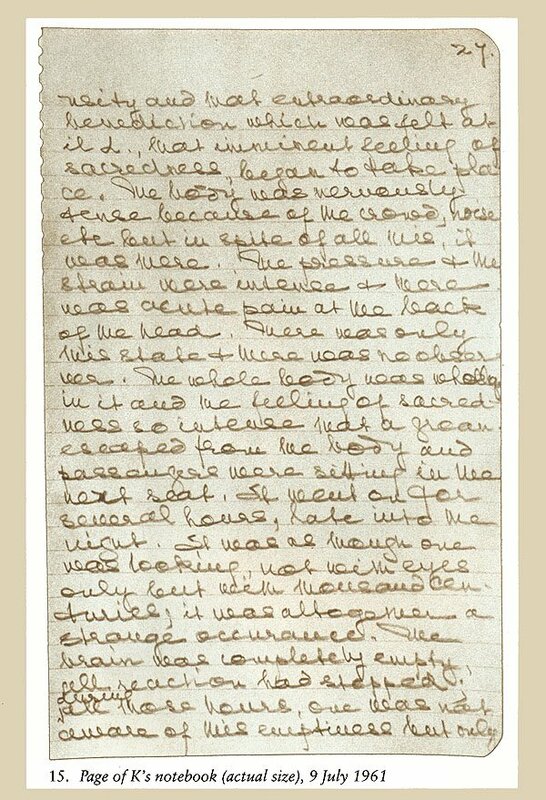 Mrs Besant asked on arrival if she might remove her hat, shaking out her short white curls when she did so which my mother later found to be characteristic of her. My mother remembered thinking that she had eyes like a tiger, of a curious shade of brown, which seemed to look right through her and penetrate her inmost thoughts. My father, at this first meeting, liked Mrs Besant and was impressed by her, especially when she asked him before she left to design the new English Theosophical Headquarters in Tavistock Square (now occupied by the British Medical Association). It was only gradually that he came to resent her influence over my mother. In 1929, at the age of thirty-four, Krishnamurti severed himself from the Theosophical Society, after a spiritual experience that completely changed his life, and renounced his role of coming messiah to travel the world as a teacher with his own religious philosophy, unattached to any orthodox religion or sect. The single object of his teaching was to set men free from all the cages which divide man from man, such as race, religion, nationality, class and tradition, and thereby bring about a transformation in the human psyche. 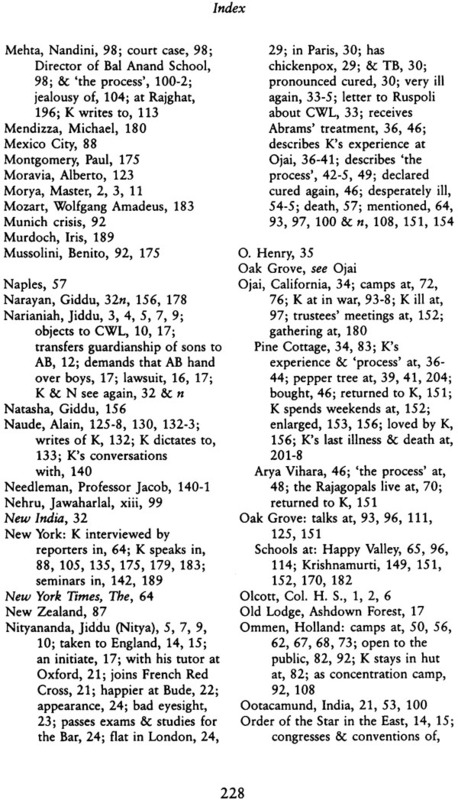 There has been no diminution of interest in Krishnamuri's teaching since his death in February 1986, three months before his ninety-first birthday. Indeed, his reputation is spreading. The reason why he is not even better known is that he never sought personal publicity. People heard of him through word of mouth or from accidentally coming across one of his books. 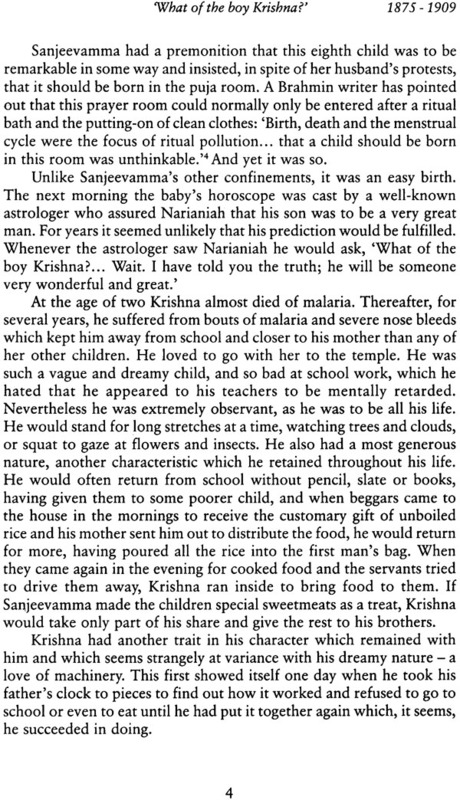 Krishnamurti refused to be anyone's guru. He did not want people to follow him blindly and obediently. He deplored the cult of gurudom and transcendental meditation brought from India to the West. Especially, he did not want disciples who might create another religion around him, build up a hierarchy and assume authority. All he claimed for his teaching was that it held up a mirror in which people could see themselves exactly as they were inwardly and outwardly, and if they did not like what they saw change themselves. 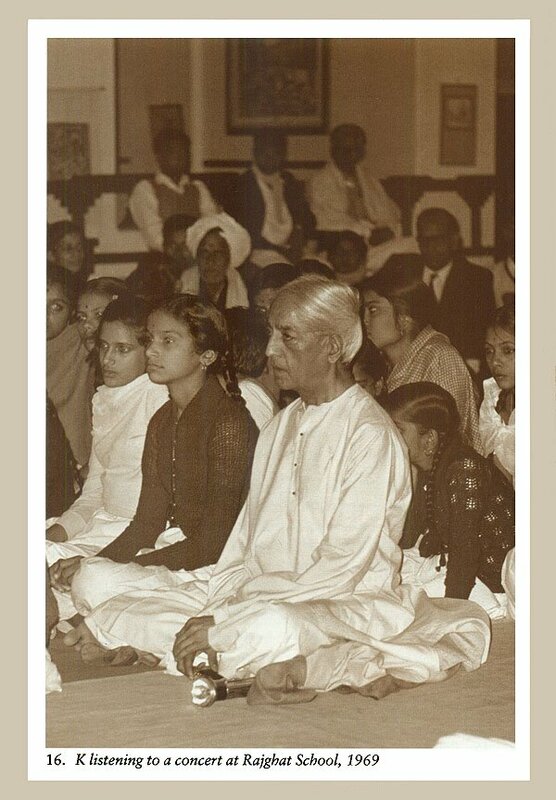 Krishnamurti's special interest was in the education of children before their minds became rigid with the prejudices of the society in which they had been born. The seven schools he founded and which bear his name - five in India, one in England and one in California - still flourish. His oldest school, Rishi Valley, founded in the early 1930s between Madras and Bangalore, now has 340 students, a third of them girls, and a reputation for being one of the best schools in India. His English school in Hampshire, the smallest, has only sixty pupils, but of twenty-four nationalities and an equal number of boys and girls. 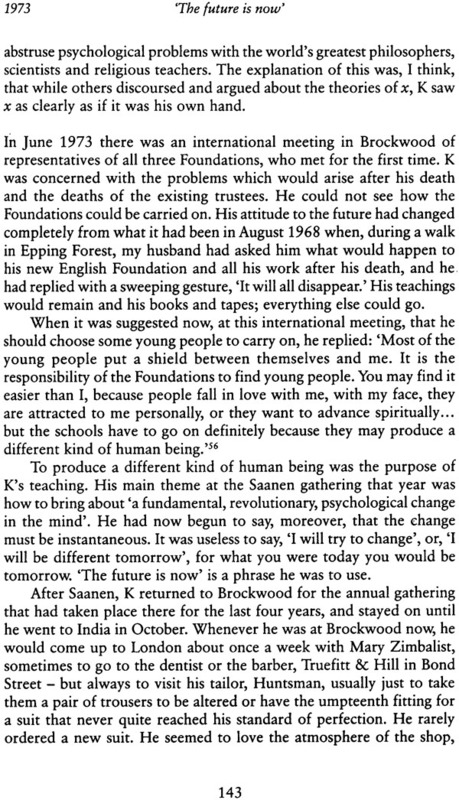 A large Krishnamurti Centre for adults was opened soon after his death, close to the English school though quite separate from it. The conception of this Centre, and the building of it was one of Krishnamuri's chief concerns in the last two years of his life. * Three smaller adult centres have now been built in India. 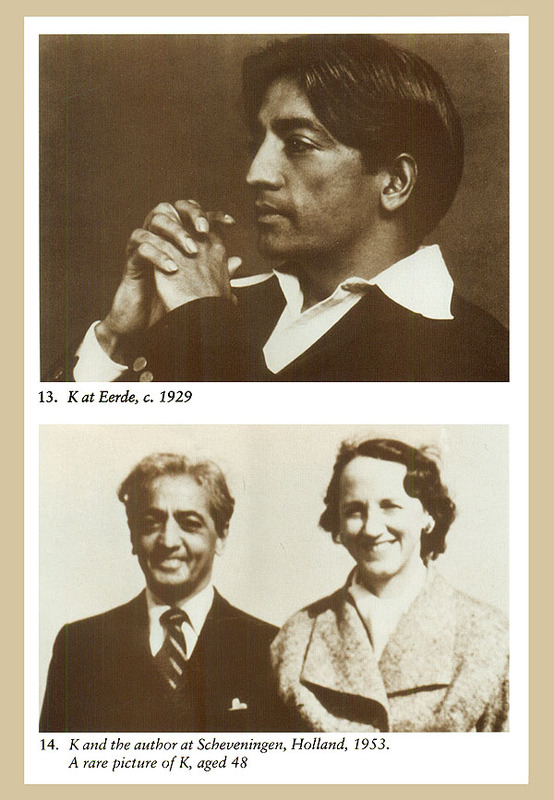 Krishnamurti also established three Foundations in the 1960s - in England, India and California, and a subsidiary one in Puerto Rico - of a purely administrative nature, each with its board of trustees. There are also associated committees in twenty-one countries.